This 1:5,000-scale model of the West Garo Hills, Tura and Sasatgre, Meghalaya was completed in 2003 in India. 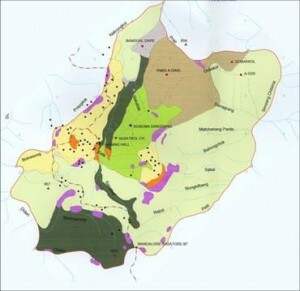 At the time of the “North Eastern Region Community Resource Management Project for Upland Areas Project” (NERCRMP) implementation, land tenure was extremely complex in the area. The traditional clan controlled-system, which secured subsistence cultivation rights and access to forest produce, had been rapidly eroding. The uncertainty of long-term access to land, or the ownership status, was one of the major limiting factors when a farmer or a community made decisions on land use and long-term investments. 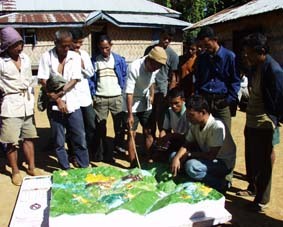 In May 2003, within the context of the North Eastern Region Community Resource Management Project for Upland Areas Project (NERCRMP), the West Garo Hills Community Resource Management Society (WGRHCRMS) hosted a training on P3DM facilitated by Philippine Association for Intercultural Development (PAFID), a Filipino NGO. The event was supported by the International Fund for Agricultural Development (IFAD) and the International Centre for Integrated Mountain Development (ICIMOD). In the NERCRMP, community based planning through village-based organizations (natural resource management groups) proved to be effective for optimization of land use leading to improved livelihoods. 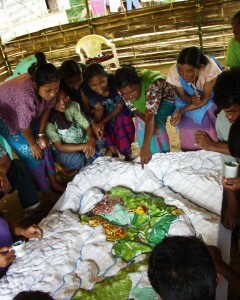 In these villages, livelihoods aspirations of the communities were captured through 2-D participatory mapping. Communities covered by the project had their own sketch maps representing land uses, land capability and planned land uses. However, the maps were neither geo-referenced nor drawn to scale, making it challenging to determine the relative size and area of the various land uses, e.g. jhum fields, forest cover, etc. The same was true with the location of village boundaries making it difficult to accurately grasp the area covered by each village. It was felt that a geo-referenced, spatially representative tool would strengthen on-going community planning and development processes. Hence, the introduction of Participatory 3-D Modelling (P3DM). Upon the initiative of the NERCRMP, with the guidance of Philippine Association for Intercultural Development (PAFID) a Mission was undertaken in February 2003 to: (i) determine areas for improvement in the documentation of local spatial information; (ii) provide information on participatory mapping using P3DM to the Project staff and village members; and (iii) determine its appropriateness and acceptability from the stakeholders and the project staff of the NERCRMP. Based on the Mission’s findings, P3DM was tested in May 2003, in Sasatgre village, which lies in the Nokrek Biosphere Reserve. Based on the activity report at ICIMOD, in addition to enhancement of natural resource management planning and livelihoods goals, staff envisaged that P3DM would assist in developing a process, which would be replicable for other Protected Areas. The objective was to ensure that plans developed by communities be included in larger management plans for Nokrek National Park and the buffer zone area. At that time, drafting and development of a buffer zone management plan was a high priority of the Forestry Department. However, initial efforts to draft such a plan paid limited attention to the actual resource management and utilization initiatives of the communities. The situation was due to lack of updated information on actual resource utilization and management activities. It was envisaged that, once more villages would have produced their P3DM, recommendations could be formulated on a workable policy for participatory buffer zone management and guidelines developed.